The Mercedes-Benz C-Class has had a breezy run so far. It came in quite literally looking like a baby S-Class and unlike the CLA, gave you a more authentic sedan experience. Now, to better a formula that was working already, the C-Class gets a facelift. There’s a tweaked exterior, updated interior, and a little jiggle in the specs. That's it, there's your review. Ok, ok, yes there is. It may not look like it at first because the updates may not be immediately apparent, even if you already are a C-Class owner. In this C 220d guise, the car gets a revised set of bumpers. Though, not easily discernible, the new bumpers do make the C look sharper, especially up front. The major changes, though, are with the lights. You get beautiful full LED headlights that, in our opinion, look better than the ‘MULTIBEAM’ LEDs you get in the C 300d. Unlike the latter, these LEDs aren’t adaptive, but offer excellent night time illumination. An understated change is the revised tail light LED pattern. The C-Class already looked like the S. And now, from the rear, with these lights, it looks more Maybach! Not even close. The changes inside are more noticeable, though not everything has changed for the better. Update #1 is the bigger, 10.25-inch infotainment screen, that is available with Android Auto & Apple CarPlay. The interface is super easy to use, even for a tech dunce like yours truly. It’s not a touchscreen, which does take some convenience away from the aforementioned softwares, but can be operated from the COMAND touchpad, dial or even the new steering wheel. Ah yes, this new steering wheel feels like a m-a-j-o-r upgrade from the old one. Not only does it look similar to the units Mercedes-Benz offers in its more expensive cars, it even gets the touch-sensitive controls of the E-Class. What’s appreciable is that this is a tech add-on that’s still very easy to use and isn’t a novelty feature that’s accompanied with needless complication. The steering isn’t just good to use, but it’s nicer to grip or even just look at. Also, the cabin doesn't have the old glossy trim that proved to be a bit of a fly in the ointment in an otherwise classy interior. That must-have old-school charm is delivered in spades, thanks to the new brown open pore wood trim. The attention to detail is the highlight of the cabin and everything oozes of top notch quality. Little things like the motorized rear sunblind, the manual side blinds and the panoramic sunroof with a separate sunshade for the rear row are appreciable. Expected at this price? Certainly, but the fact is that the C-Class isn’t meant to be a chauffeur-driven car and only becomes one in markets like India and China. With the rear kneeroom ranging from 545mm-795mm, the cabin space is in the same territory as mass market hatchbacks. At 885mm, the rear headroom isn’t worth writing home about either, nor is the 1345mm of shoulder room (what you’d get in some sub-4 metre sedans). So the rear seat-centric features, combined with the 64-colour ambient lighting and two-zone climate control with rear vents go a long way in improving the experience for the chauffeur-driven. Now, the misses. For one, the instrument cluster still has analogue dials with a digital MID in between. India doesn’t get the all-digital 12.3-inch screen that’s available with the facelift overseas. Maybe that's being saved for later as an update but it still doesn't make sense. Additionally, the old one had a two-pin plug below the rear AC vents that you could use to charge a laptop and get some work done. There are also other misses like memory for the front powered seats, ventilated seats or a head-up display. The C 220d and the C 300d get the same engine - the 2.0 litre, 4-cylinder diesel from the E-Class, but here it's BSVI compliant. The difference between the 220 and 300 is the tune - 194PS/400Nm vs 245PS/500Nm. Driving the C 220d is a standard issue affair, which is a good thing. There's tonnes of low-rev torque. It takes the gentlest of throttle taps to drive at city speeds and if anyone ever feels like this is just a sober car that can't do quick, you just need to poke the throttle to prove them wrong, not stomp it. 0-100kmph takes all of 7.9 seconds, quicker than the Jaguar XE 2.0-litre diesel (8.77 seconds). It's also a very efficient engine, delivering a tested 14.37kmpl in the city and 21.40kmpl on the highway. Yet again, better than the XE (City/Highway = 13.20kmpl/20.54kmpl). Refinement levels are noticeably better than the old 2.1-litre engine too, complemented by the 9-speed automatic transmission that’s smooth for daily drives and doesn't feel lazy even in comfort mode. That said, the transmission isn’t BMW ZF quick when it comes to kickdown response. Not slow by any means, but under hard kickdown, the transmission does occasionally get caught off guard for a second before downshifts. It does have nine different ratios to play around with, so that does make the 9G-TRONIC more calculative than lightning quick. It's not a particularly exciting car to drive or one that has precision cut dynamics either. There is body roll, the steering isn't the quickest to respond and while hitting high speeds is a breeze, corner carving isn’t its forte. Fun to drive? Sure. Enthusiast pleaser? Not really. For that, the Jaguar XE or BMW 3 Series will do a better job. But then again, the C-Class was never pitched for this purpose, so as a daily drive that can put a smile on your face on the weekend, no complaints. We also have to mention that the brakes are simply phenomenal. The car drops speed on the dime and with a 100-0kmph distance of 35.60 metres, the C-Class is one of the quickest stopping cars we’ve ever tested till date! As for the ride, we’d sum it up in one word - familiar. It's comfortable and flat over smooth roads and settles very quickly over undulations. But the need to settle does arise as the suspension is set up on the firmer side. Any change in road leveling and you can feel the side-to-side movement inside the cabin. So on our roads, the experience isn't going to be perfectly smooth. It can take mild potholes without losing composure, but while you won't feel a jolt unless it's a really bad patch of road, you can hear that familiar thud from the suspension. You hear it more than you feel it, but this does result in you treading lightly over rough sections. 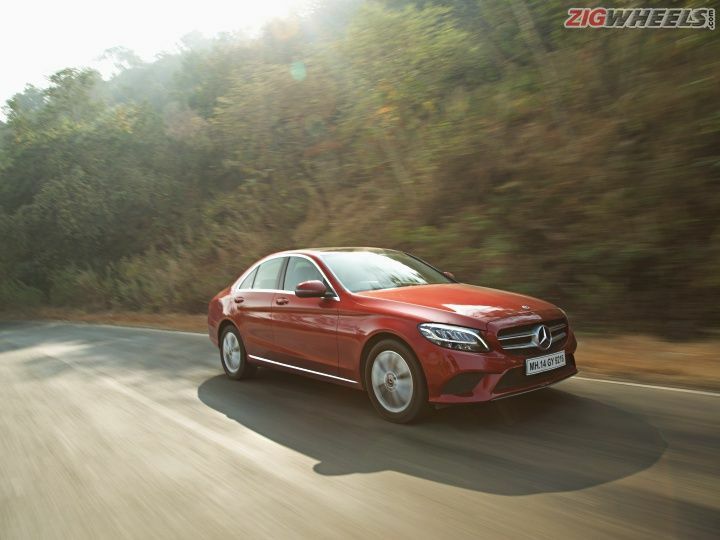 Unlike the international-spec model, the C-Class in India doesn’t get adaptive dampers. While the ride isn't a deal breaker, in this department we'd give the Audi A4 an edge. The C 220d definitely doesn’t ride as well as a similarly priced alternative like the Volkswagen Passat, but then, neither do any of its rivals. The C 220d’s updates may not seem that significant, but they actually are. It now looks classier on the inside and out, gets better tech that's still as usable as ever and the quality of everything makes it feel richer than anything else in the segment. It just has a charm that nothing else does. So yes, even with a few misses like the ride that could've been better and some feature concessions vs the global spec, at Rs 40 lakh - Rs 44.25 lakh (ex-showroom India), the Mercedes-Benz C-Class is a sweeter deal. Share your experiences with C-Class?